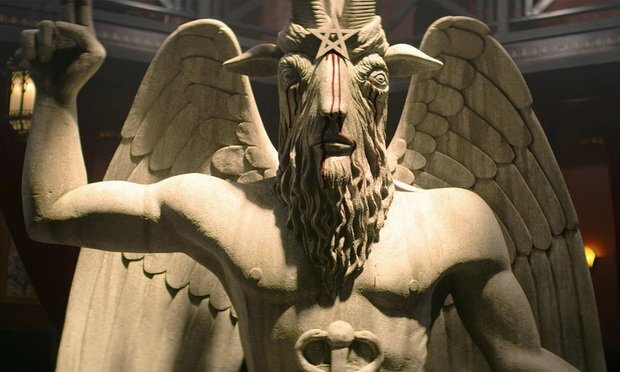 In the new Netflix series "Chilling Adventures of Sabrina," a darker update of "Sabrina, the Teenage Witch," there is a statue of a winged male figure with a goat's head prominently displayed in the lobby of the Academy of Unseen Arts. The Satanic Temple says they see that art all too clearly, and the design of that statue is a copy of their own. In the new Netflix series “Chilling Adventures of Sabrina,” a darker update of “Sabrina, the Teenage Witch,” there is a statue of a winged male figure with a goat’s head prominently displayed in the lobby of the Academy of Unseen Arts. The Satanic Temple says they see that art all too clearly, and the design of that statue is a copy of their own. Lisa Soper, the production designer for “Sabrina,” told VICE that she thought the similarities were “kind of a coincidence,” citing historical iterations of the Baphomet figure in paintings by Goya and on tarot cards. Richard Binder, based in New York, is part of the social media team at ALM. He is also a 2014 recipient of the ASPBE Award for Excellence in the Humorous/Fun Department. Richard can name every Kiss album in chronological order (only the makeup ones, though -- after "Lick It Up" they all kind of blur together) but he doesn't remember where he put his keys.